This farmhouse style Oktoberfest bench is made to perfectly complement the Oktoberfest Dining Table, but is bold enough to make a statement all by itself! Handmade from sustainable Northwest lumber, these benches are built to be extremely rugged and last a lifetime. Pre-distressed, with a durable polyurethane finish, the Oktoberfest bench can handle whatever punishment you throw at it and continue to look great year after year. 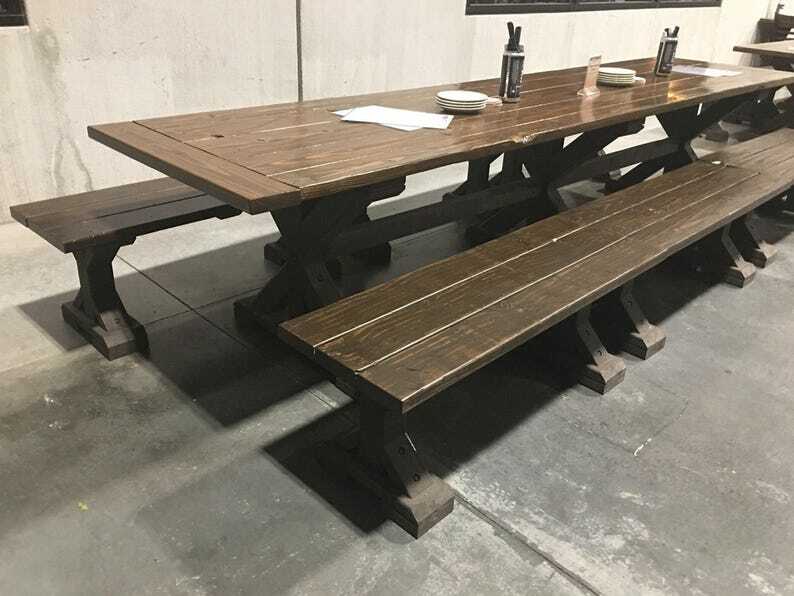 These benches can be seen in person at Stickmen Tualatin Beer Hall, Tualatin, OR. Available in both 48, 60, and 72 inch lengths, you will be able to accommodate any size room or table. Mix and match sizes to get just the right seating capacity for your room or event. Pictured is the 48 inch size in custom stain and contrasting base color. Tables not included but are also available separately in another shop listing. We love to customize, so minor changes to this design are welcomed! ***Local Pickup Preferred*** -Because calculating shipping of large, heavy items is not an automatic process on Etsy, I will take shipping requests on a case by case basis.